Have you been injured by a collapsing deck? We’ll get you the compensation you deserve. Deck collapses can many times be attributed to poor construction or improper maintenance. Many times decks become rotted and perhaps filled with termites or other insects, which weakens the wood. Many times people add a deck to their home as an addition and use a contractor that perhaps is not certified or does not follow the building code. Sometimes the deck is not properly attached to the home. When decks first became popular there were no building codes in place to regulate deck construction. Therefore, older homes which have decks attached may not be up to code and may pose a danger. Also decks that are built with lumber that is not pressure treated do not hold up as long or as sturdily as decks that are built with pressure treated wood. Lumber that has not been pressure treated rots much quicker than pressure treated lumber. If you or a loved one has been injured in a deck collapse and would like to consult with an attorney to review your options, please contact us at the Bennett Law Group. We have obtained significant results for many previous clients in handling deck collapse cases. 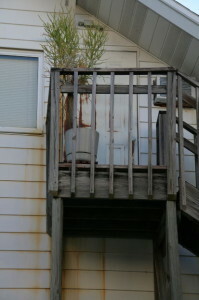 It is very common for older apartment buildings to have decks that are not safe, perhaps the wood is rotted or perhaps they are no longer securely affixed to the building. Sometimes decks collapse due to an overload of weight on the wood. Perhaps too many people are on the deck at the same time, or perhaps there are items on the deck which are too heavy for the wood, such as hot tubs, heavy grill equipment, very heavy furniture, or other appliances. You may have incurred significant medical expenses as a result of the accident. Perhaps you are facing future rehabilitation and treatment costs. You may have missed time from work due to your injuries. Whatever your situation, when you have been injured due to the negligence of another in not maintaining their property in a safe condition, you are entitled to be compensated for your injuries and future rehabilitation and related expenses that arise out of your accident. Seek medical treatment immediately. You may be injured even though it’s not apparent at first; therefore it’s a good idea to always get checked out. Also you will need the medical documentation of any injuries you have suffered as evidence should it become necessary. Take pictures of the scene. You can use the camera on your cellphone. This will further document the damage and serve as evidence if needed. Consult with a deck collapse attorney. You can contact us here at the Bennett Law Group and we will schedule a free consultation to sit down with you and go over the facts of your case. If you or a family member has suffered injuries as a result of a deck collapse due to the failure of another to maintain their deck in a safe condition, contact us at the Bennett Law Group. We have over 50 years of experience in representing clients in Atlanta and throughout the state of Georgia. We will do everything possible to ensure that you receive the maximum compensation allowed by law for your injuries, medical expenses, lost wages, and future medical treatments. Contact us online or call us at 404-541-9330. We look forward to hearing from you.